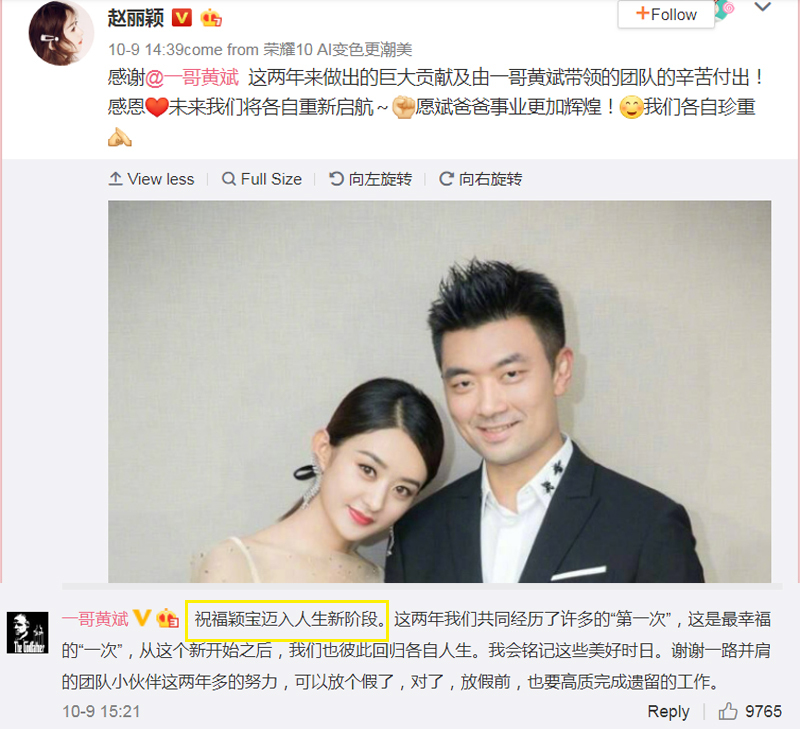 [UPDATE Oct 16] The rumours turned out to be true after all, Chinese actors Zhao Liying and Feng Shaofeng have tied the knot. 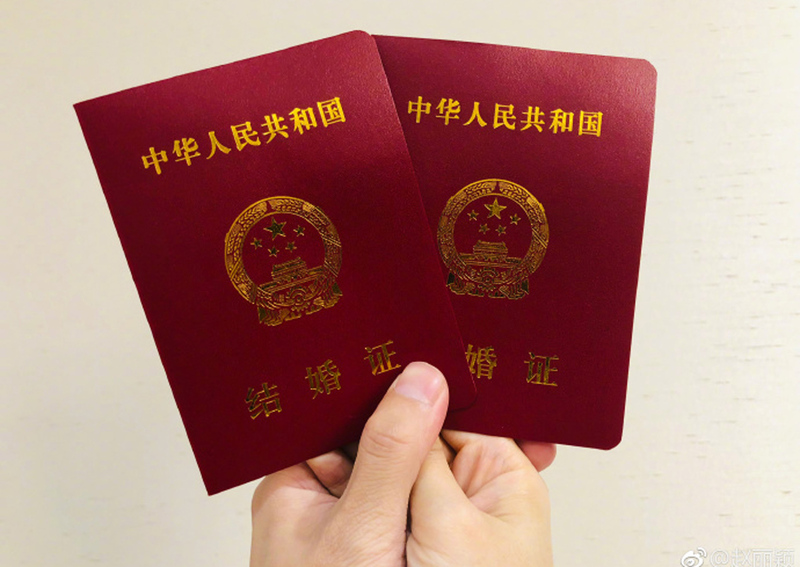 The celebrity couple announced their union on Weibo on Tuesday (Oct 16) - which is also the actress' 31st birthday - and posted a photo of their joined hands holding onto their marriage certificates. Have Chinese actors Zhao Liying and Feng Shaofeng tied the knot in secret? China's microblogging platform Weibo is abuzz with rumours that the pair registered their marriage on Sept 1. Rumours of them dating surfaced this year after they co-starred in the third instalment of The Monkey King. In the movie, romance blossoms between Buddhist monk Tang Sanzang (Feng) and the queen of Womanland (Zhao). The rumours turned out to be true after all, Chinese actors Zhao Liying and Feng Shaofeng have tied the knot. The celebrity couple announced their union on Weibo on Tuesday (Oct 16) morning and posted a photo of their joined hands holding onto their marriage certificates. The date of the marriage announcement also falls on the actress' 31st birthday. Zhao and Feng will reunite as a couple onscreen in historical romance drama The Story of Minglan, which is slated to air in 2019. Could the two have fallen in love in real life too? The answer may be a 'yes' as Zhao, 30, and Feng, 40, have been spotted holding hands in public several times. And the A-list actress' announcement in July that she's taking a hiatus from work has also sparked pregnancy rumours. This week, Zhao said on Weibo that she has parted ways with her manager of two years. In a reply, he wished her "all the best with the next phase of her life" which netizens say alludes to her new status as a wife. If the marriage rumours do not turn out to be true after all, fans can still catch Zhao and Feng as they reunite as a couple onscreen in historical romance drama The Story of Minglan, which is slated to air in 2019. Zhao is best known for her role in hit 2015 Chinese drama The Journey of Flower, while Feng rose to fame for his roles in the film Wolf and Chinese drama Prince of Lan Ling.